Jewish food has undergone a transformation, and Leah Koenig is one of its leading agents of change. A savvy food writer whose work has appeared everywhere from Saveur and Food & Wine magazines to Epicurious.com—and who is the author of our own The Hadassah Everyday Cookbook (Rizzoli)—Koenig’s latest book is Modern Jewish Cooking: Recipes & Customs for Today’s Kitchen (Chronicle Books). In this new collection, she finds ways to honor our heritage without feeling bound by it. Her book contains a basic primer on kosher cooking as well as a brief history of Jewish food including Ashkenazic, Sefardic and Mizrahic, plus gorgeous photography that helps the recipes leap off the page. And while all of the components you need to make a traditional Jewish meal—latkes, halla and brisket, for instance—appear, they are imbued with thoughtful tweaks that improve on the originals. Take, for example, her schav. “I really didn’t like the original version,” says Koenig of the tart, sorrel-based soup with Ashkenazic roots. So she reimagined it, adding silky and creamy elements before traversing the culinary globe to gild the soup with harissa, the spicy condiment with roots in Morocco. “Because East European food tends to be heavier and richer, having a bright note from Mizrahic and Sefardic kitchens suits my tastes,” says Koenig. Many of her adjustments are subtle—cooking traditional gefilte fish in white wine-court-bouillon in lieu of fish stock, or adding a hint of maple syrup to a rosemary-roasted chicken—but the results are revelatory. These hamantaschen are a great example. The sugary dough is supple and tender and doesn’t stick to countertops and rolling pins. Its filling incorporates classic poppy seeds with chocolate, highlighting both ingredients as opposed to creating a battle between them. 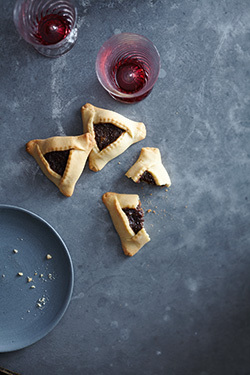 Koenig’s section on hamantaschen—Purim begins on March 4!—also includes savory versions, like sweet potato-parmesan and tomato- beef, proving that even a holiday classic benefits from a fresh perspective. 1. Make filling: Grind poppy seeds in a spice or coffee grinder until powdery. In a small saucepan, bring milk, sugar, ground seeds and apricots to a simmer; lower heat and cook, stirring, until most liquid is absorbed and mixture thickens, 8-10 minutes. Add the juices and butter and cook until absorbed, 2-3 minutes. Stir in the chocolate and vanilla and cook, stirring constantly, until the chocolate melts and the mixture is very thick, 2-3 minutes. Cool before using. 2. Make hamantaschen: Whisk together the flour, baking powder and salt in a medium bowl. 3. In a large bowl whisk together the orange juice, vegetable oil, sugar, eggs, vanilla and lemon zest. Slowly stir in the flour mixture, mixing until dough begins to come together. Turn dough out onto a flat surface and knead a few times until smooth, but not sticky. (If dough is dry, knead in more orange juice by the teaspoonful. If dough is too wet, knead in flour 1 TB at a time.) Gather the dough, then cut in half and form into two flat disks; wrap each disk tightly in plastic wrap and refrigerate at least 3 hours, or overnight. 4. Preheat the oven to 350°F. Remove half the dough from the refrigerator. On a lightly floured surface roll the dough to 1/8-inch thickness. Cut as many 3-inch circles as possible, then transfer to parchment-lined baking sheets. Gather dough scraps, reroll, cut additional circles and transfer to baking sheets. 5. Spoon 1 tsp filling into center of each circle. Fold left side over on an angle, followed by right side. Fold the bottom flap up, tucking one end under the side flap to make a triangle-shaped pocket; pinch seams to seal. Repeat with remaining dough and filling. Bake until lightly golden and browned at corners, 15-20 minutes. 6. Remove from oven and let cookies cool on baking sheets for 5 minutes, then transfer to a wire rack to cool. 1. Combine the apricots, raisins, orange juice, water, and sugar in a small sauce­pan set over medium high heat. Bring to a simmer, then turn the heat to low, cover, and cook, stirring occasionally, until the fruit is very soft and most of the liquid is absorbed, 20 to 25 minutes. 2. Remove from the heat and use an immersion blender to blend the fruit into a chunky purée; or mash with a potato masher. Let cool completely before fill­ing hamantaschen. If desired, make up to 3 days ahead and store, covered, in the refrigerator. 1. Make the filling: Place the sweet potato and garlic in a small saucepan and cover with cold water. Bring to a boil over high heat, then turn the heat to medium and simmer until the potato is very tender, 10 to 15 minutes. Drain well. 2. Meanwhile, heat the olive oil in a small pan set over medium heat. Add the shallot, season with salt and pepper and cook, stirring occasionally, until browned, 3 to 5 minutes. Remove from the heat. 3. Using a potato masher or fork, mash the sweet potato and garlic into a thick purée. Stir in the thyme, shallot and Parmesan. Season with more salt and pepper and let cool slightly before filling hamantaschen. If desired, make up to 2 days ahead and store, covered, in refrigerator. 4. Make hamantaschen: Whisk together the flour, baking powder, dried herbs and salt in a medium bowl. 6. Gather the dough, then divide it in half with a knife and form into two flat disks. Wrap each disk tightly in plastic wrap and refrigerate for at least 3 hours, or up to overnight. 7. Preheat the oven to 350°F and line a large rimmed baking sheet with parchment paper. Remove half the dough from the refrigerator. On a lightly floured work surface, roll the dough to a 1/8-inch thickness. Use a 3-inch round cookie cutter or glass to cut out as many circles as possible and carefully transfer them, about 1/2-inch apart, to the prepared baking sheet. Gather the dough scraps, reroll, cut out additional circles and transfer them to the cookie sheet. 8. Spoon 1 teaspoon of sweet potato-Parmesan filling into the center of each dough circle. Fold the left side over on an angle, followed by the right side. Fold the bottom flap up, tucking one end under the side flap to make a triangle-shaped pocket (the filling should still be visible in the center); pinch the seams firmly to seal. Repeat the process with the remaining dough and filling. 9. Bake until lightly golden and browned at the corners—15 to 18 minutes. Remove from the oven and let the cookies cool on the baking sheet for 5 minutes, then transfer to a wire rack to cool slightly. These are best served warm. Store in airtight container in the refrigerator for up to 3 days. Reheat leftovers briefly in a toaster oven.